Animal Friends: June is Smitten Season! Priceless Cat Adoptions and More! June is Smitten Season! Priceless Cat Adoptions and More! 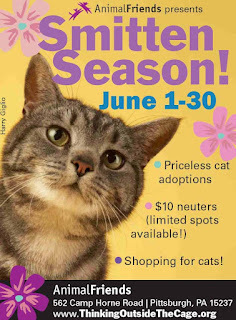 June 1 kicks off Smitten Season at Animal Friends! That means “priceless” cat adoptions, $10 neuter surgeries and shopping for cats and their people. Shelters face tough times this time of year…the dreaded “kitten season.” Kitten season is when the weather warms and cats give birth to litters. Shelters struggle to accommodate the overwhelming influx of kittens that come through their doors every spring and summer. Sadly, many shelters are forced to euthanize unwanted kittens simply because they don’t have the space. But Animal Friends isn’t most shelters. That’s why they’re holding “Smitten Season” – a celebration of cats! Priceless cat adoptions! Animal Friends would like to encourage adopters to give the more mature felines (who are so frequently overlooked) some special consideration. 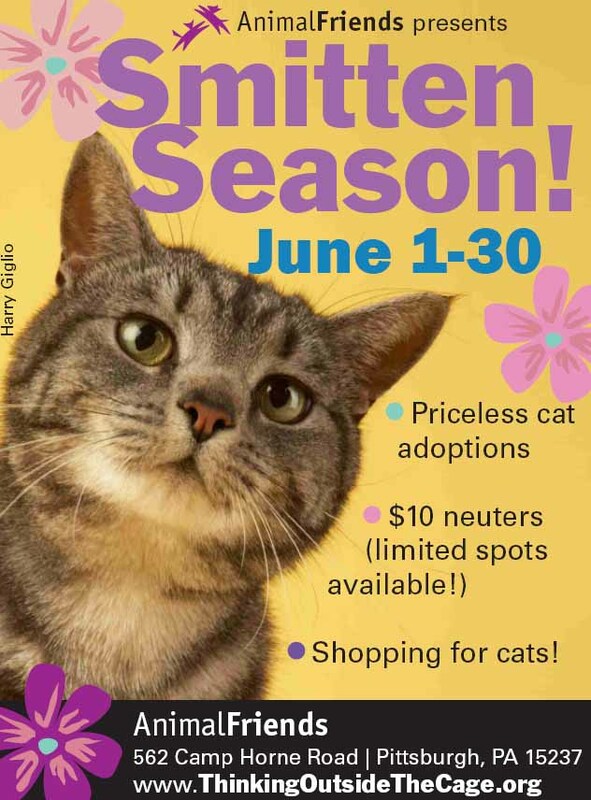 From June 1-30, cat adoption is priceless! Animal Friends will waive the $75 adoption donation for all cats ages 2 and up! Our Low-Cost Spay/Neuter department is offering $10 neuter surgeries for male cats. Appointments are limited, so please apply via www.ThinkingOutsideTheCage.org beginning June 1. Animal Friends’ pet supply shop and boutique is offering specials on cat treats, toys, and other supplies plus raffles for cat lovers. Smitten Season highlights what Animal Friends does best: They save lives! Visit Animal Friends at 562 Camp Horne Road, Pittsburgh PA 15237 or call 412.847.7000 for more information. You can also visit www.ThinkingOutsideTheCage.org.